At every Toronto show that I attend, I can't help but feel that the art and craft communities seem to be shrinking. However after this weekend, I have come to realise that the communities are not small, rather I am starting to know more and more of the members. 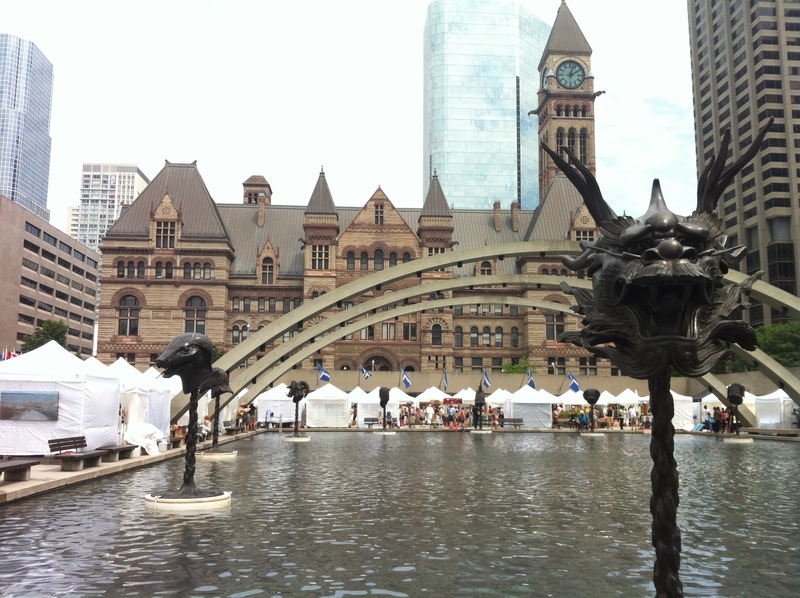 Take this year's Toronto Outdoor Art Exhibition (TOAE 2013) for example. A former classmate and I went down to the show yesterday morning at 10am, planning to be home by the time the sun was highest in the sky. Instead, it was nearly 6pm when I finally arrived home - sporting a wicked sunburn and blistered feet. I've been lucky to make it through a (large) art show in under 3 hours only once before. This is a feat that was relatively impossible, especially when it seemed that every other booth had somebody that I knew, and stopped to chat with (not to mention all of the enticing artwork that one could spend hours feasting their eyes on). The technician at Sheridan jokes that TOAE should be called the SAAE - Sheridan's Annual Alumni Exhibition, as there are so many former grads who participate in the show. My classmate and I stopped at one of our colleague's booth and within ten minutes, there were 7 Sheridan students (current and alumni) all crammed in, catching up and admiring the work. We joked that it was as if a fog horn had gone off, alerting Sheridan alumni everywhere to congregate at Yellow Booth 259. It was hot and humid, but a delightful day for a show. Nathan Phillips Square was packed with a sea of white tents, and a larger sea of moving bodies. The range of work at the show was enticing - installation, sculpture, printmaking, ceramics, glass, jewellery, painting, photography, and more! Much more! After spending seven hours looking at prices, checking out booth designs, networking and catching up with friends, I feel strongly encouraged by this venue. Maybe TOAE 2014 will be in the cards for me next year. Until then, I'll just keep making pots. 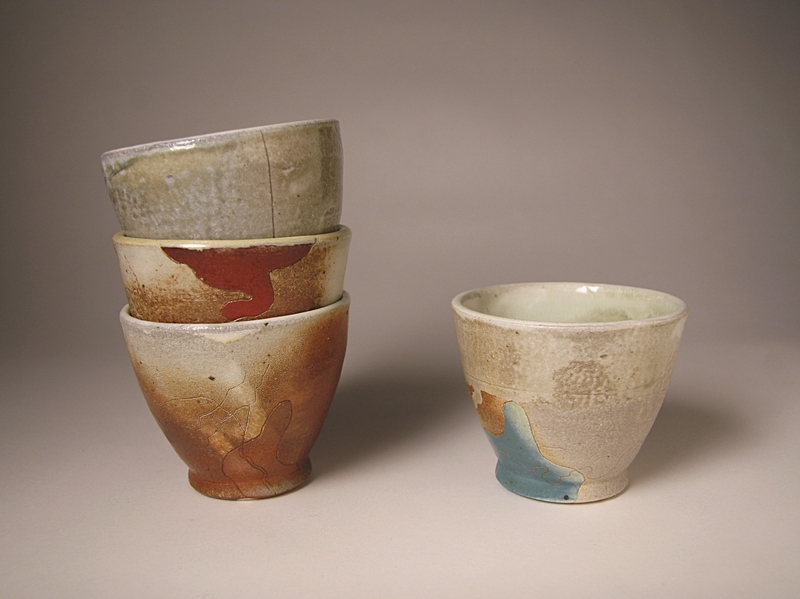 These are some juice cups fresh from the wood-soda kiln. Looking forward to more of these. The Home of a Famous Rodent. 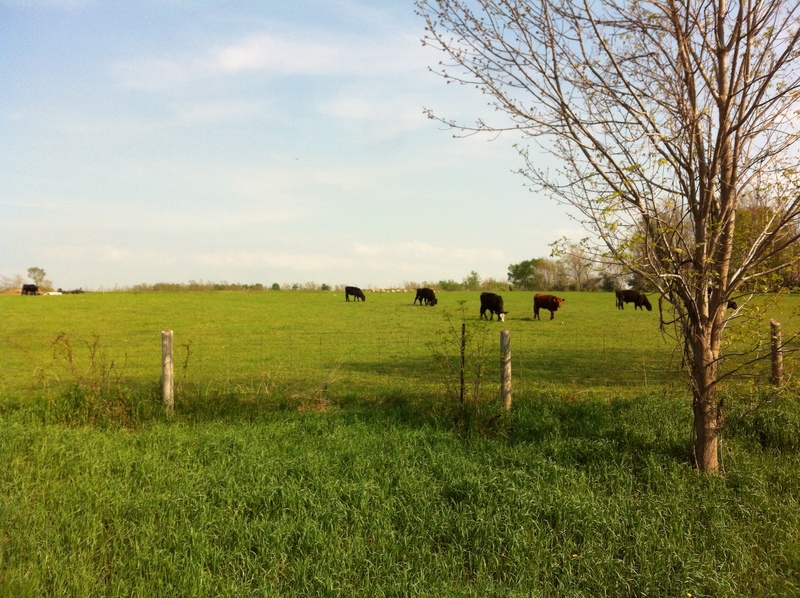 Well, I'll tell ya, I understand why Willie likes it up here so much. For those of you not from Canada (and potentially Ontario - I'm not too sure just how "famous" he really is) Wiarton Willie is a groundhog living in (you guessed it!) Wiarton, Ontario. This groundhog is our local representative who annually prognosticates the end of winter - or not so much. Ah, Groundhog day. Last weekend I moved up into Willie's stomping grounds to begin my apprenticeship at Gleasonbrook Pottery (GBP) with Sheridan alumnus Timothy Smith. 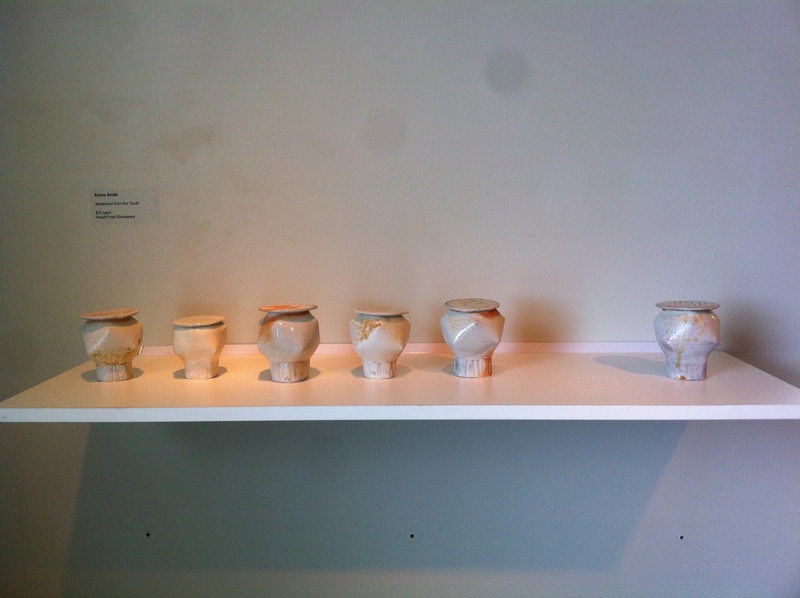 Tim graduated the ceramics program at Sheridan before starting his own studio in the Bruce Peninsula. For over a dozen years Timothy has been hiring two students from Sheridan to work with him over the summer. 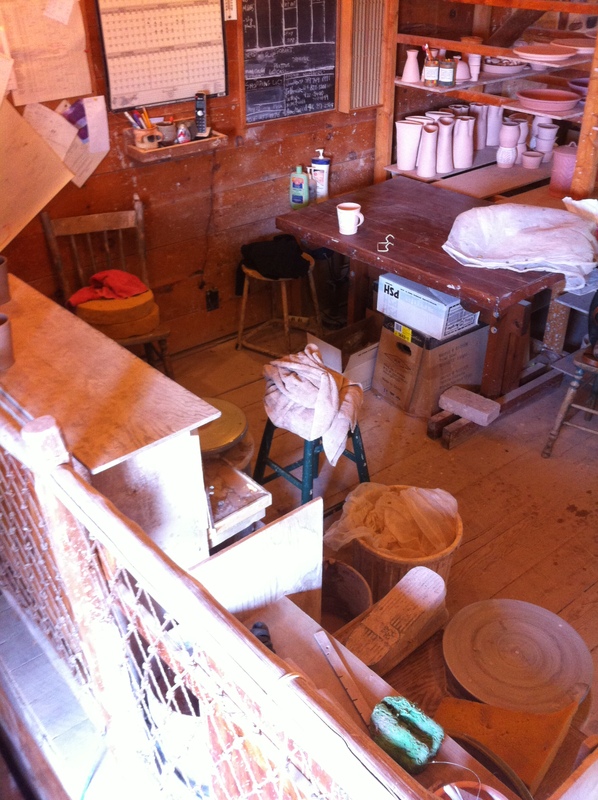 This year I was lucky enough to be chosen to join him in Wiarton and spend the summer making a LOT of pots. I've been in town just over a week and I'm already getting a great vibe from the locals. The downtown "core" (ie. one road) is quaint and humble. It boasts a couple cafes, a Salvation Army, Home Hardware (what would a small town be without a HH? ), a dollar store and a cigar shop. Other notable stores: video rental, bank, LCBO and one gas station. Everyone is very friendly. 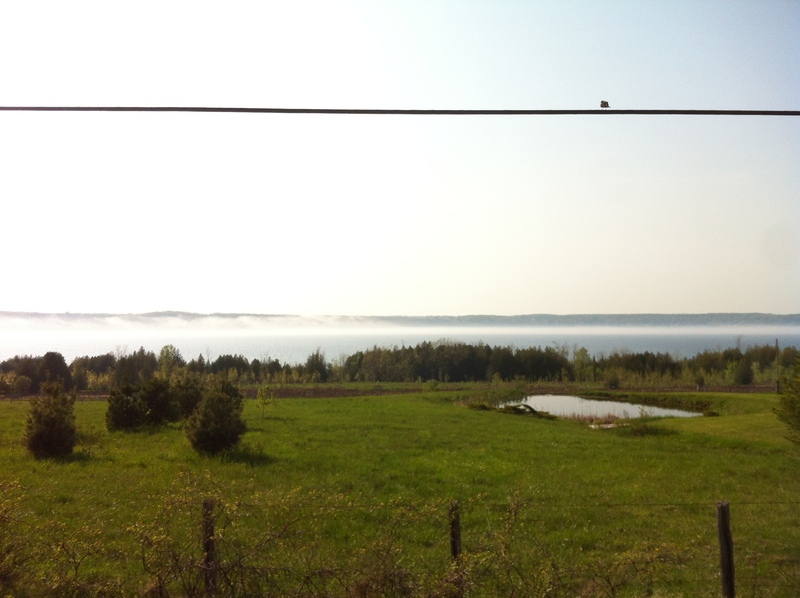 A quick bike ride from my new digs (a lovely little house with a luscious backyard) is the waterfront of Colpoy's Bay, a small inlet of Georgian Bay. I can see the water from my window and boy, is that view lovely. I eagerly look forward to the summer when I can walk down to the public dock and jump out into the bay for a refreshing dip. Since I've been in school I have rarely been physically active. I haven't had the time or energy to come home from the studio and go for a run, or join a sports team. However, in a small town like Wiarton I am now able to use my bike as my primary form of transportation. So over the weekend I changed my inner tube and this morning biked the route to work. What a lovely way to start your day! GBP is a 5 mile drive up the highway, just outside of Wiarton. The highway follows the shoreline and today I finally got to soak in the view the way it was intended to be: slowly, with the breeze in my face and the sun beating down on me. Working with Timothy has been great so far. We drink lots of tea, listen to good music and chat about all sorts of things while we work away. On top of throwing I have been doing a lot of sanding, glazing and organizing of the shop downstairs. I have been learning a lot, and there will be lots more to learn over the course of the summer. Last week I spent a good chunk of my work days making dessert bowls (seen in the middle photograph above). This week I've been making mugs and hell, I hate those mugs. They are so deceivingly simple in form that I've been finding them IMPOSSIBLE to replicate. The profile of the form is slightly flared with an ever-so-subtle belly to give the piece volume. The top lip and bottom have identical punctuations that start and stop the line of the wall. No matter how hard I try, I am struggling. I start to get the shape down and the lip and base look like crap. When I finally get the base looking right, the form has gone awry. These mugs will be the end of me. On a side note, I made some of my own work over the weekend. A dozen dessert stands and 10 chunky little plates to hang on the wall. It's much easier to make my own work (and a lot less pressure), but the work for Timothy is exercising me in different ways than I'm used to. I'm being forced to throw the same form a hundred times, even if I'm bored and keep plugging away until I get it. In my own practice, I would have given up much sooner. Discipline and determination are being fostered in way that I have never encouraged them before. And, I'm getting better at tap-centering*. Wahoo! The last couple of weeks at school were a blur of packing and openings. As graduates, we were allowed a couple extra weeks to vacate our studios and find somewhere to take all our craps. We quickly found out that we needed those extra weeks. Not only did we need to take several trips to and from the school with our stuff, but the buffer was important for our mental health. We needed to be removed slowly, at our own pace and take our time to decompress. After such a stimulating year, the studio was quiet and often empty. The time was needed to adjust to this change and prepare for a new beginning. 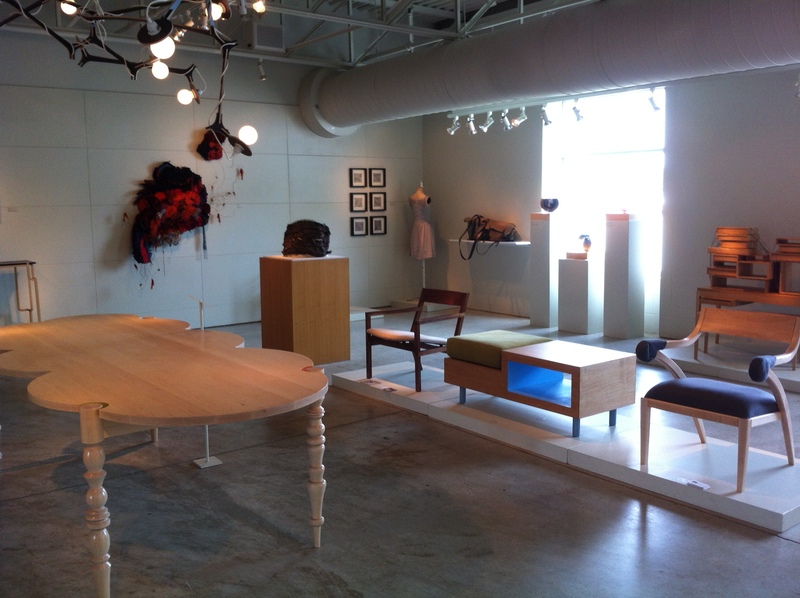 Our final show was rightfully hosted in the Craft and Design gallery at Sheridan. The opening took place after the annual Tulip Ceremony, where the graduates are each presented a tulip and awards are given out to students in all years of the program. I was asked to give the Valedictory address for the ceramics graduates at this year's Tulip Ceremony. When asked, I didn't know what to say. What can you say to eight people who have not only been your classmates, but your family? What wisdom did I have for the eight people who I have learned so much from and so much with? How could I begin to describe my love for these people, this program? "We're moving out. I've moved out of the ceramics studio before, but it wasn't nearly as hard. In fact, it was a joyous occasion. The school year was over. We could take a four month break before returning in September. This time is different. We're not returning, and much to my parent's dismay, I have dozens of boxes that need more than a temporary home. They will be needing a permanent place, because their previous home is no longer. There's a feeling of homelessness while we pack up our shards of broken experiments and try to organize all our glazes and materials. We collected boxes from the garbage outside Annie Smith because we didn't realise just how much stuff we have. The mass accumulates, we had the space and we filled it. We have finished pieces, half finished pieces and pieces we wished were finished but aren't yet. Some of us still have wet work that needs to be wrapped up like a baby in order to survive the car ride home. To wherever home is, because, at least for me, when I think of home, I think of my studio in the loft. 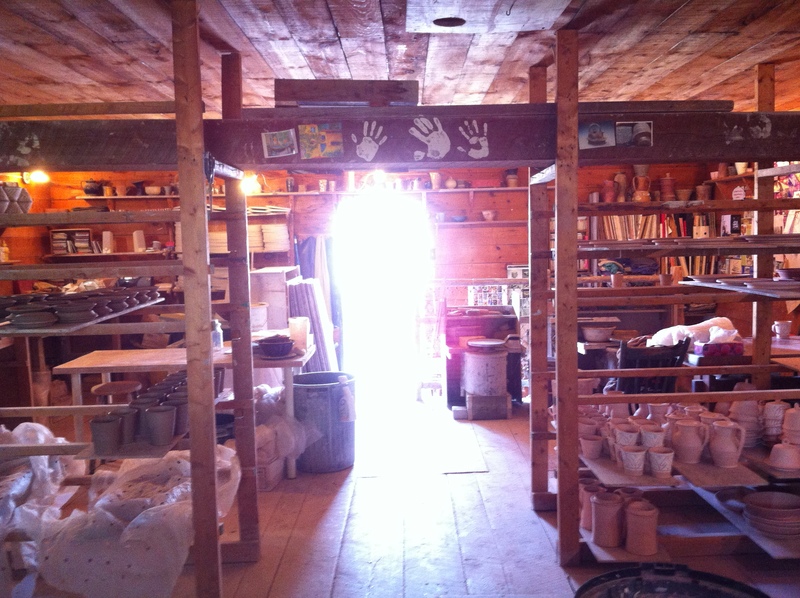 I hear the drone of the clay mixer and the pounding of the glass studio's music. I feel the anxiety of deadlines in the air, like a layer of dust settling on us all. I can hear the laughter, the cursing, the crying and the consoling. For the past year, Sheridan has been our home. Our families and friends have seen little of us, but we've seen a lot of each other. I've spent more time in this building, with these people, than I have any other. We are taking a lot with us when we leave. Boxes of clay, buckets of glaze and lots of dirty clothing are only the beginning. We are also taking learned techniques and practised experiences. We are taking souls full of wonder and curiosity, anticipation and dread. We are taking more than just what we have been taught and more than we have made. We are taking what we have lived and what we have learned. We have learned to hold THE BEST potlucks, and to enjoy eating the leftovers the next day. We have learned to use the kilns to heat up said leftovers, and keep them cold overnight. We learned that communal coffee breaks are the best medicine. We have learned that sleep is important, but by no means necessary. We are leaving with the knowledge that this job is hard, but it is rewarding. And above all, we have learned that you must always, always compress your clay. We wouldn't be where we are today without such an amazing group of people supporting us the whole way. On behalf of the ceramic graduates I would like to thank Linda, our fearless leader, for pushing us to near exhaustion and teaching us that you can never work too hard. Thank you to Hugh, our fantastic technician, for making the impossible possible, for being the handiest of handy men and for gently reminding us when we are making stupid mistakes. Gord, your wisdom has been invaluable and your tenderness always appreciated. Thank you for it all. To our amazing faculty, Tony, Marc, Bruce, Win, Janet, Lindsay, Steve, we would not be here without your dedication, encouragement and reflections. Some of us know what we're going to do when we stop coming to this place, but the majority of us don't. But whether it be further education, attending a residency, setting up a studio or decide "screw it, I'm going to be a fire-fighter", we will all be okay. We will make it, and we'll learn and grow along the way. There are many more shards of experiments in our future, in fact, I hope there will be. Because the most fulfilling part of this experience has been the acceptance of our vulnerability. We have learned to laugh at our own embarrassment, begin to conquer our insecurity and channel our pride. We have taken risks, we have set ourselves up for failure, we have lost and we have won. It has been one hell of a ride." Farewell Sheridan, you will be missed. Back in April we fired Scarlet again for our last time. We won't be returning to Sheridan in the fall so our access to atmospheric kilns has been cut off (unless of course the students next year invite us to put a couple pieces in). We kicked it into high gear during the last two weeks of school and tried to produce as much work as possible so we could fully stack the wood kiln and soda kiln with our work. This time firing Scarlet we were smarter. We loaded her up on the Saturday night, went home for a good night's sleep and returned early Sunday morning to get her going. I had the first shift and relaxed in my comfy chair by the tiny fire for hours drinking tea. No heavy duty stoking required in that early morning shift. 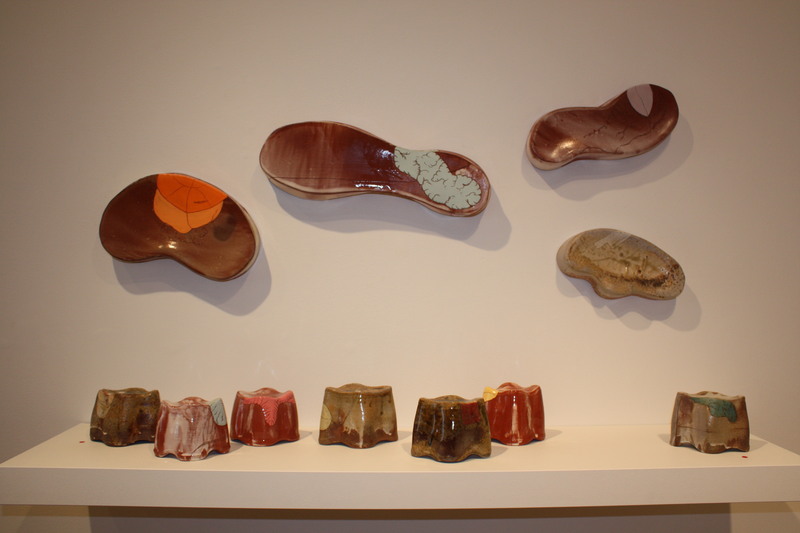 The second half of the show was the work of the furniture and ceramics students. I met with a couple fellow students, Linda Sormin (our studio head) and our amazing installer Carmen to set up for the show. At the end of a long day we had all the wall work installed, all the plinths for furniture painted and the space was set up, ready to place the work. A big thank you goes out to Carmen for returning the next day to finish set up and look after the final details! 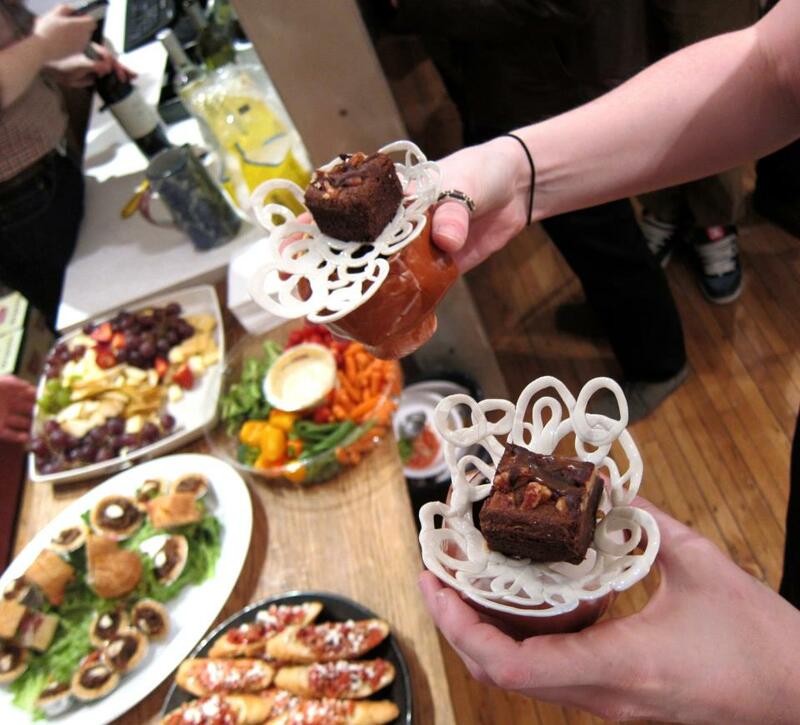 Part of my work for the OCC included a performance piece, where I invited two people to intimately serve desserts to the audience at the opening. These lovely ladies, decked out in theatrical outfits and high heels, drifted through the overflowing opening and invited the audience to experience my dessert stands, by snacking on the macarons, tarts and rum balls that were delicately placed on their lace doilies. A strong interest for me lies in the human condition and how society acts and reacts in certain situations. This activity brought back a breadth of information on the ways in which humans interact with each other intimately. Some people at the show accepted the offer gratefully, with unwavering delight. Others were sceptical, not only pausing to question the food itself, but the kind gesture of a complete stranger. Finally, THANK YOU to the Ontario Crafts Council for hosting the event and continually supporting Sheridan College's Craft and Design program. So many of the opportunities available to us are thanks to their efforts and encouragement. For more information visit the OCC's website. Over the past week my studio mates and I have been anxiously (and frantically) preparing for our upcoming show at the Gardiner Museum, Toronto. An annual event, the Gardiner show is cause for celebration, pride and anxiety among all graduates in the Ceramics program. Not only will we be presenting our current work in public for the FIRST TIME, but it's at the only Canadian museum dedicated to Ceramic Art. Making work for the exhibition, though important, is not the only cause for fluster in the studio. We've also been working on developing our promotional material. This week we have "played graphic designer", fiddling away for hours on Adobe Illustrator and Photoshop and diving into the worlds of typography, dimensions and the digital layout. Last night I must have looked at my name in over 200 fonts, in a variety of pt. sizes and colours. The variety never ends, and it is overwhelming. 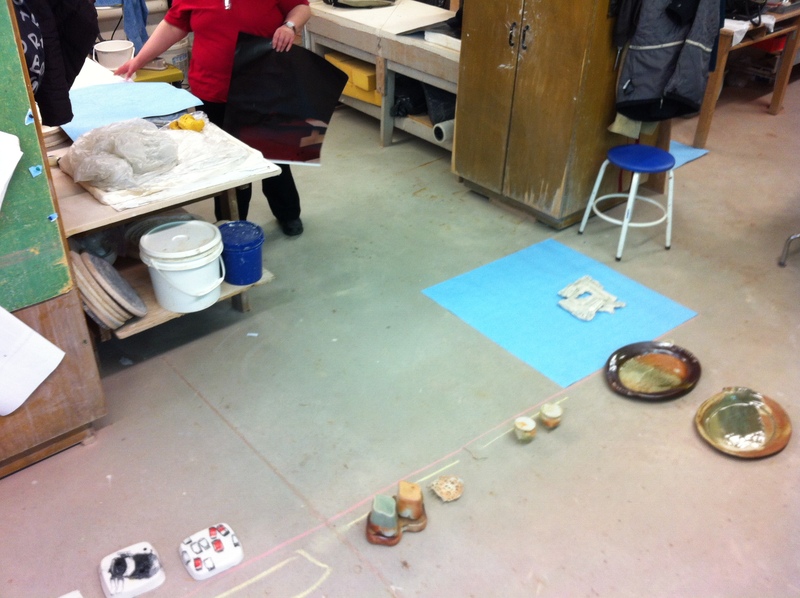 We have also been "playing curator" in our studio, marking out dimensions of the show space on the floor while navigating around wedging tables, damp closets and throwing wheels. We have tacks on the wall with plinth heights, paper templates of the plinth dimensions on the floor, and an Excel spreadsheet so we can even continue playing with floor plans when we are at home in bed. 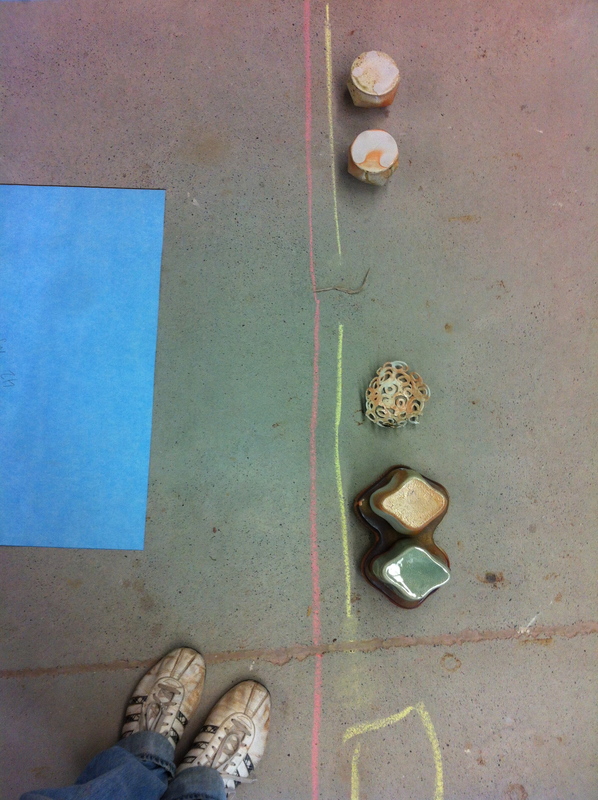 Monday morning we marked out our floor plan in chalk and started to lay our work out, in order to imagine the space. The time change and early morning may have been a factor, but I felt as if I were in a life size version of a Sims game, where the furniture keeps rearranging. There were nine of us shifting around "plinths" here and there, pulling out the measuring tape and tiptoeing around fragile ceramics on the floor. Our print out of the Excel spreadsheet had us moving around miniature cut outs of plinths and playing lego with them on the table. Chaos would be an understatement. Though eternally frustrating, the process was helpful. We were able to better visualize the space, and account for room between plinths to move around. After a few hours we had settled on a floor plan, where everyone's work would be and what height they would look best at. I guess real curators do this too. 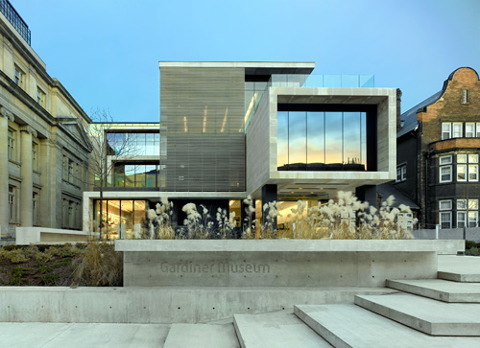 Our graduate show will be at the Gardiner Museum in Toronto, Ontario from April 4th - April 18th. The opening (where you can meet myself, my studio mates and have free food and drink) is April 4th from 6-8pm. The opening will be a great time to network, learn about the artists and talk to us about our work!